IMG_1372, originally uploaded by All Things Mimi. I cheated and used a store bought pie crust. There, I said it. Put the crust in a pie pan (I used a glass one). I thawed one box of frozen chopped broccoli and sprinkled it on the crust. Make sure you get rid of any extra liquid from the broccoli. I put about 2 cups of shredded cheddar and colby jack cheese over that. I put half a container of mushrooms over the cheese. After the quiche is assembled, put it in the oven at 450 for about 15 minutes. Then put a crust guard over the crust edges and turn heat down to 300 degrees and bake for about an hour (or til the middle sets). We will probably eat on this for breakfasts and lunch all this week. 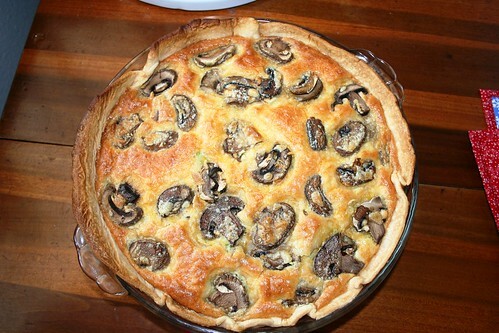 Quiche is a great thing to have in the fridge.